DUSHANBE: Prime Minister Nawaz Sharif on Thursday attended the inauguration ceremony of the Central Asia South Asia (CASA-1000) transmission line near Dushanbe in Tajikistan on Thursday, Radio Pakistan reported. The $1.2 billion, 750-kilometre-long transmission line which is expected to be complete by 2018 will allow Pakistan to import electricity from Tajikistan and Kyrgyzstan via Afghanistan to minimise the country’s electricity shortage. 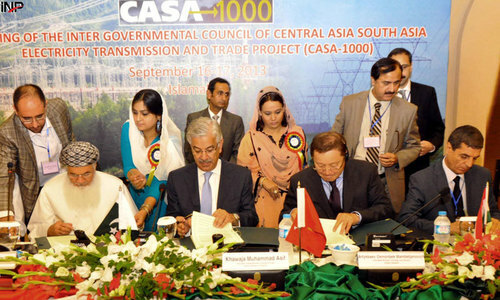 The initial plan is to transmit about 1,300MW electricity from Republic and Tajikistan to Pakistan and Afghanistan. Pakistan will consume about 1,000MW of the exported energy while 300MW will be used by Afghanistan. Around 16 per cent of the transmission line of will pass through Tajikistan, 75pc through Afghanistan and 9pc through Pakistan. Tajik President Emomali Rahmon, Afghan Chief Executive Abdullah Abdullah and Kyrgyz Prime Minister Sooronbay Jeenbekov jointly launched the project alongside PM Nawaz. Nawaz Sharif at delegation-level meeting during his two-day trip to Tajikistan agreed to strengthen bilateral relations, particularly in areas of trade, energy and connectivity with his hosts. Pakistan, Afghanistan, the Kyrgyz Republic and Tajikistan ─ the world’s third largest producer of hydroelectric power ─ have been pursuing the development of electricity-trading arrangements and the establishment of the Casa Regional Energy Market (CASAREM) since 2005, starting with the supply of 1,300MW which may go up to 2,800MW in subsequent years. 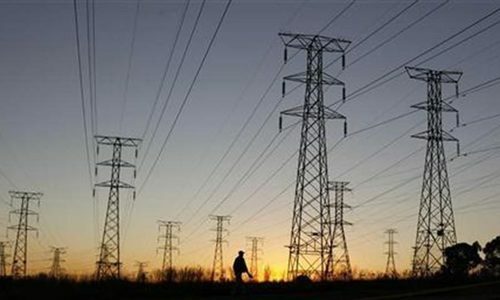 The Afghan government has given a sovereign guarantee to protect the section of the transmission line passing through it. The Casa-1000 project will comprise the development, financing, construction, ownership and operation of the AC and DC facilities. 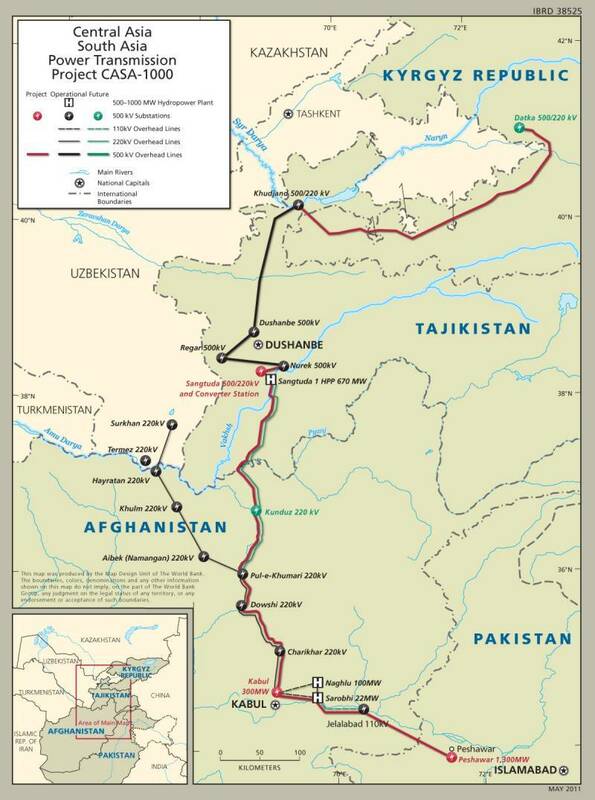 The transmission line originates from Kyrgyzstan with substation at Datka to Tajikistan's four substations including Sughda, Dushanbe, Regar and Sangtuda and then passing through Afghanistan to Pakistan with a converter station at Nowshera. This will include a 750km high voltage direct current (DC) transmission system between Tajikistan and Pakistan via Afghanistan, together with associated converter stations at Sangtuda (1,300MW), Kabul (300MW) and Peshawar (1,300MW). A 477km 500kV alternating current facility will also run between the Kyrgyz Republic (Datka) and Tajikistan (Khoujand). System upgrades will be required to safely and reliably accommodate the AC and DC facilities and the associated power flows. On one hand we continue to drain the precious rain waters and melting glacier waters into Arabian Sea but on the other hand signing more and more contracts to import electricity from abroad. keep it up! Pakistan needs mega dams and self reliance in power generation. Mashallah!!! Even if this electricity expansive than one imported from Iran. This is a very smart move foreign policy wise to bring central asians countries into Pakistani embrace. We badly wanted our extended neighbouring countries to like us coz immediate onez hate us except China. They should run the power lines through Wakhan Corridor. Buying electricity from Tajikistan does not mean that it would leave its traditional friends, India and Iran in this case. Tajikistan has given an operational Air Force Base to Indian Air Force for regular dah-to-day use and Indians are using this airbase close to Tajik-Pak border. 1,300MW is not much. Considering the $1.3 bn cost of installation. Pak should rely on domestic production coz if a day comes that tensions rise vis-a-vis India or the world community at large, all such supplies would be suspended. I feel ashamed that we are even incapable of making electricity ourselves...it is a shock we can't make power plants n dams. We have abundant sites to build dams for power generation. Why not utilise these to generate cheap electricity. See the fate of Neelum-Jhelum Power Project. Its completion is delayed by many years and there is huge cost escalation. Is there anyone to accountable for this national loss? Good move ,Ultimately we have to produce our own electricity to reduce reliance on others ,if we continue same policy ,others can force us to do things as they wish which may be adverse to our national interests.In current era, self sufficiency in economic matters is biggest security of any state & i think energy is life blood to economy. our country is self sufficient in natural resources but inefficient in their utilization . 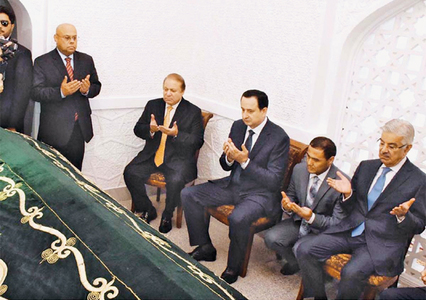 NS has never looked so busy, flying around from one corner to the other, inaugurating one project after an other.. Timing is very curious. Or just a coincident after the Panama Leaks? Let's hope he doesn't forget his next appointment for a medical check up in London! Where are our engineer graduates from Wapda? What are they for? We have many thousand of Electric and civil engineer in Wapda even they told us buy power from some where , we cant produce it. God bless , time to go in Europe! Good to see we are working on Pakistan "specific" projects. Why in 2018???? ?why not now? ?It`s been 2013 when he came in power...what he did till now???? Whoever thought of this must be a genius. First of all it increases our dependence on foreign suppliers. And secondly, the transmission line passes through past, present and potentially future war zones. How smart is that? And how much will the electricity cost the consumers in Pakistan? Because it is common knowledge that long transmission lines are very inefficient. @Faisal Bajwa The terrain is too mountainous and would have high building and maintenance costs in the immediate and long run respectively. This is the way forward to develop Pakistan. Energy is needed to speed up industrialization, as well as improving performance of industry sector, both critical for employment creation & export promotion. @seemab .He has done quite alot .things are better than they were in 2013.And every one has to accept it .electricity situation is getting better day by day.Old factories opening up and industries are getting more gas and electricity.This will create ecomnomic opprtunities for the poor.Surely the rich wont like it as this does no benefit them. Pakistan need to construct Kalabagh and Basha dams immediately . Cannot imagine how the lines will be safe in Afghanistan. Doubtful person has inaugurated another doubtful project like Nandipur. First and foremost Pakistan needs to use its own electricity judiciously so that line losses and theft are precluded. It will save country's energy and we'll not need to import it from abroad spending national exchequer widening country's budget deficit further. Currently, Pakistan's energy shortfall is around 3500MW which can easily be met by saving lost energy. @seemab things are getting better in Afghanistan recently. And in 2013 sure it wasn't safe to run a gas or electricity line from northern afghan. For short term solution, good work. For long term, be self reliant. Great news, Pakistan should have excellent ties with fellow Muslim countries. Well done PM of Pakistan. Congrats to PM Nawaz for this project .But it could have been more appropriate if PM Nawaz remain at home,to clear the Panama mess,and sent President Mamnoon to Dushanbe. PM must know the more you are out,the more your government gets in secured .If you wish to complete your tenure don't go anywhere. This will give afghans some leverage over Pakistan.